Cooking has the Food Aspiration (Master Chef, Master Mixologist) and the Culinary Career. One of the best reward traits, your food never spoils once you are a Fresh Chef. Prepare a party-sized dish, leave it on the counter and take a serving whenever hungry. (Patched) Servings taking from the dish will spoil. The Potion Master reward trait allows you to mix mood potions from the bar. Each potion costs §1,000 and gives +100 for 3hrs. A mythical recipe bought off an mysterious hermit. Who knows what effects this drink may hold? Snaggle Fluster is a recipe only unlockable from a career event at Mixologist Career level 9 (Drinkmaster). Snaggle Fluster requires Mixology 10, costs §50 and gives Dazed+3/3hrs. While the moodlet (purple) is on, skills advance rapidly (Skill Gain ×4; Effective Skill ×2). For comparison, Night Owl gives ×1.25 (Skill gains are additive, so Night Owl+Snaggle Fluster=×4.25). Snaggle Fluster appears under “Make Special Drinks” when you have a relevant mood but can be made all the time (click on “Skill” to sort, it’s a Mixology 10 drink). Unlike normal drinks, queuing up multiple “Make Drink” will cause you to drink all of them. Snaggle Fluster does not spoil. 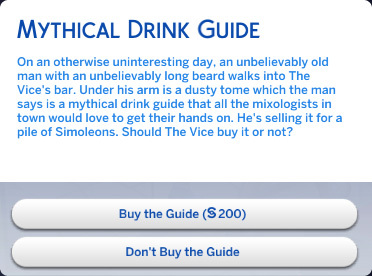 Mythical Drink Guide On an otherwise uninteresting day, an unbelievably old man with an unbelievably long beard walks into Your Sim's bar. Under his arm is a dusty tome which the man says is a mythical drink guide that all the mixologists in town would love to get their hands on. He's selling it for a pile of Simoleons. Should Your Sim buy it or not? Buying the guide costs §200 and may not unlock the recipe. To stay at Mixologist Career level 9, change your work option. Skipping a day will also lower Job Performance. You do not need ingredients from Gardening or Fishing to make Excellent! food. It’s so easy to prepare Excellent! 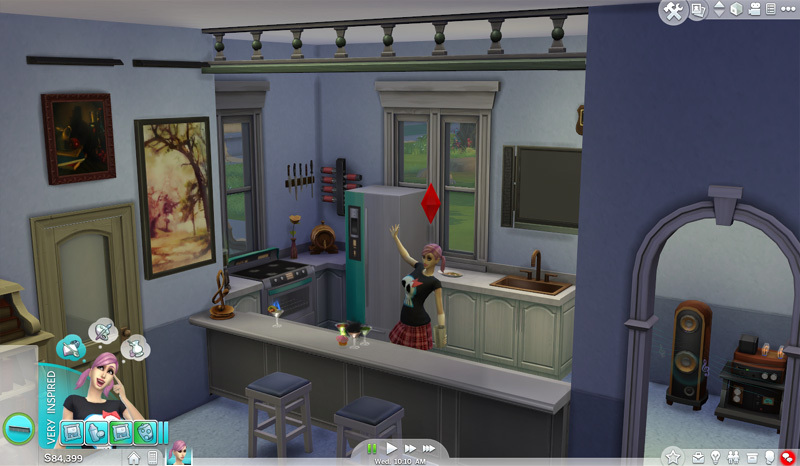 food you do not need the Starting Aspiration Bonus Trait or Flavorize (Stove). Even if you only produce Good food, you can still “Garnish“ to raise it to Excellent!. While eating, you can watch the Cooking channel on TV. Mixology is a great way to get Inspired quickly. To complete both Food aspirations, you must take the Mixologist branch of the Culinary career. (Outdoor Retreat) Food cannot be “Garnished” to Impeccable. ♥ Foodie – Gain moodlets from eating good food. ♥ (Outdoor Retreat) Stoves and Grills Master (1,500) – Cook Impeccable food and Herbalism potions. All skill lists do not include new recipes or tricks. All abilities are unimportant, except Gourmet Cooking unlocks at Cooking Level 5. ♥ Level 10 – Garnish dishes, improved quality.